Rise picks up a bit after Once ended. Eve is now a princess and a wife, struggling to overcome the grief of losing her true love, Caleb. Eve is no longer the little girl she was, and now with the help of the other rebels, she is working to finish the work Caleb started. Working close with the rebels, she is ready to bring down her father, the King. But not everything is what it seems and Eve must make tough decisions in order to survive. I have so many mixed emotions about this book. There are things I enjoyed, and there are things I didn’t. Eve has grown so much through the books. She started out this irrational child and in Rise, she finally becomes a strong woman. There are things about her life that have changed who she is forever. And there is still more surprises for her to discover. In this book, Eve must finally take a stand on which side she chooses and who will stand with her. I enjoyed getting to know Eve throughout the trilogy, and am glad to see the individual she has become. I think the part that I missed the most in this book was Caleb. I loved him in the other two books, especially in the first one when we really get to know him. He was a part that was missing and it was hard for me to keep turning the pages and not expect him to be there. I understand why his absence was necessary to Eve’s growth, but at the same time, I felt the book lacking from his presence. The other characters played a part in the book as well, but Eve was the main concern throughout. And while, I once again understand, I really wish we saw more Eve and Caleb. I really enjoyed their relationship in the earlier books and I also really enjoyed Caleb’s relationship with other characters. Lastly, I kind of wish the ending had a few more pages after it. I won’t spoil anything by mentioning particulars, but after reading the book and reading my review you’ll understand. I think the fans of the series would’ve liked to see more, so they could feel it more fully. Rise is the third and final installment of the Eve trilogy. I’ve enjoyed reading the series and hope others have too. Can’t wait to see what Anna has in store for us in the future! 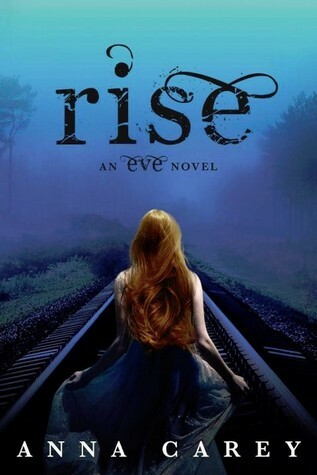 Rise comes out April 2nd, 2013!